The worst act of violence Paris has suffered since the German occupation during World War II, with over three hundred people in hospital… but, Drills were planned in Paris for that very day: Patrick Pelloux, chronicler at Charlie Hebdo, explained on France Info radio that Paris police were prepared because, “as luck would have it”, they’d planned an exercise to train for multi-site attacks on that very morning, Nov 13,2015. Here is a response from the day after: “I also knew last night watching KELLY FILE on FOX that the “parade” of “survivors” on camera with Space Blankets looked very fishy – – at least 4 of these people coming out of the Concert Hall were SMILING ? laughing ? would you be smiling after witnessing a blood bath massacre as we’ve been told? People fall back into the same trap and believe the media. Some of it is real. 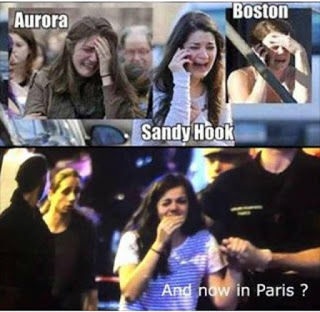 Some of it involved crisis actors….all of it involved the Elite who have been planning this for along time.” – Barbara Joshua. Whatever happened in that music hall continued for one hour before the police started to arrive (Source: survivor testimony I heard on the radio, today the 15th). A pristine passport found left by a dead terrorist for ID, after he went bang in a football stadium – where have we heard that one before? ‘Within minutes following the attacks, which were launched simultaneously, and prior to the release of a preliminary report by the police, France’s media went into overdrive. News commentators and intelligence analysts on France’s network TV stated with authority that the attacks emanated from Syria and Iraq…The attacks were described without evidence as an act of revenge and retribution against France for having bombed ISIS strongholds in Syria and Iraq as part of Obama’s counter-terrorism air campaign. In the very early hours there were no bloody scenes reported, no eye witnesses telling us what happened, lack of activity from emergency responses (I expect to see a mass rush of emergency calls but nothing) ISIS constantly being blamed, captions in the headlines saying immigrants were shouting for Syria when attacks happened and how emergency measure and tighter control will be needed to deal with this threat. 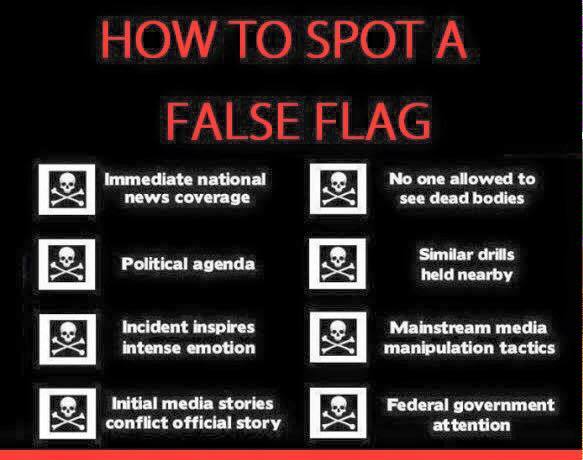 All this to me is the call signs of a false flag event and is very similar to the london bombings. Within minutes it’s all being given to us what happened, CCTV footage seems to be hard to come by, it will most likely be confiscated and kept under national security. That is almost identical to the phrase Tony Blair used, on the afternoon of 7/7! 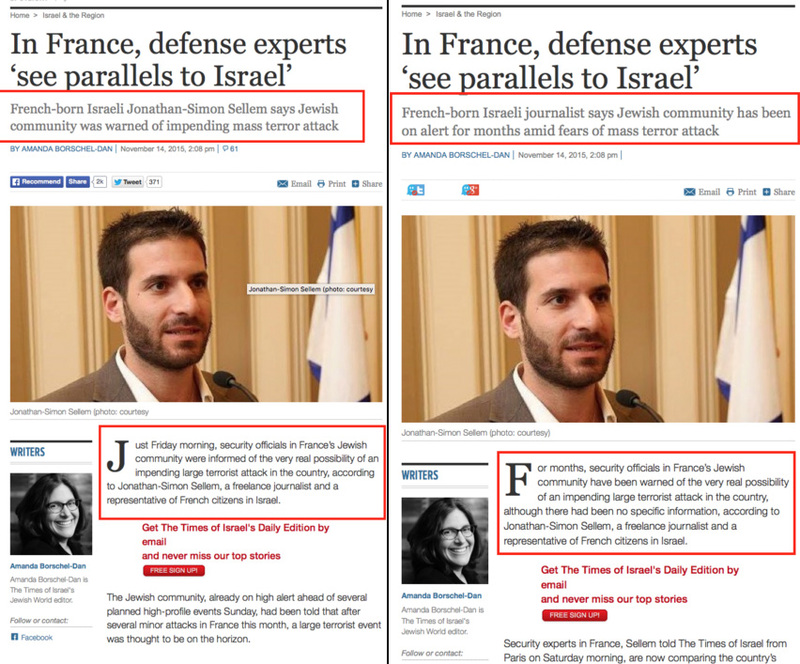 French media immediately started comparing the November 13 attacks in Paris to 9/11, intimating that France was at war and that the alleged Islamic State attack was from abroad, i.e. the Middle East. Without debate in France’s National Assembly, a State of Emergency was declared throughout France – lockdown under military law. The attack included a football stadium at which the President was attending – hardly a coincidence: foreknowledge of his location would have required significant planning and preparation. This large-scale event has to be, state-sponsored terror, but by whom? “The scale of the attack is that of a military operation. It would have required a large group of well trained militants, well armed and funded, with experience in planning and executing coordinated military operations, moving large amounts of weapons clandestinely, experts in the use of weapons and explosives, as well as possessing intelligence capabilities used to somehow circumvent France’s increasingly colossal surveillance capabilities. A prediction was made just one week beforehand, that terror would strike France – as a clandestine CIA attack. This happened on Friday 13th, and only a few days earlier was Halloween, when the Russian civilian plane was shot down. …a report from European security that there was a massive cyber attack on French systems 48 hours prior to and during the Paris attacks. Amongst other things, the attack took down the French mobile data network and blinded police surveilance This was …a sophisticated attack that targeted a weakness in infrastructure hardware. Such an attack is beyond the capability of most organizations and requires capability that is unlikely to be in ISIL’s arsenal. An attack on this scale is difficult to pull off without authorities getting wind of it. The coordination required suggests state involvement. Indeed. And this is the only explanation we are likely to receive, as to why shooters should be able to spend a whole hour in a crowded theatre killing people – before police arrived. Two of the reported dead in the Bataclan music theatre have turned out to be still alive. Police showed up at his family home to report his death. Quoting from The Times of Israel, the Jewish owners of the Bataclan theatre, who had had it for forty years, decided to sell shortly before this event – and did so on September 11th. They were quite strongly pro-Zionist, holding Israeli-type events there, and they emigrated to Israel after selling it. The co-owner Joel ‘told Channel … he took a call from the theater at the time of the attack and I could hear the gunfire.’ He added that a member of the Eagles of Death Metal was “hit by a bullet and killed.” “There is blood everywhere,” he said. “It will take three days just to clean that up.” Well thanks for all that info! So, after selling it, they just happened to be on the phone to the new owners, and he could hear the gunfire.Would the new owners really wish to phone Israel at such a moment? Those who design these events remain hidden, but they cannot resist adding their signature, to their masterpiece, as it were. That is the signature. Those are the perps. Its the usual story. 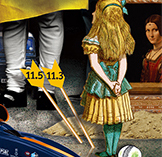 Next to Alice are two arrows, with numbers on them,11.3 and 11.5. These have no obvious meaning, but unscrambling them gives the above date, does it not? Nothing else happeend in 2015 relating to these numbers. They are writtenj on arows, indicating somethng lethal. And thet are by the feet of Alice, indicating ‘going through the looking glass’ – alluding to the mirror-delusion proces where by the State creates the Enemy that citizens hate and fear. On October 25, 2015, Michael Snyder posted an article predicting that “The World in 2015” Economist magazine cover might foreshadow a false flag event in November – as indeed it has. The thing that is most important with regard to the latest manipulation in Paris is not whether it is a hoax or not. It is however a very interesting issue, that I will not deny. But the most important matter is that this is a manipulation, staged or not, and those responsible are as always, very easy to identify because essentially they all work for the same masters, whether they know it or not. Getting caught up in technical issues that are truly inferior to the bigger issue of what is at play is a mistake in my view. I am in no way saying we should not look at every angle, hoax, not a hoax, Mossad/CIA responsibility, Russia in on it or not, etc., indeed we should, but let us not be distracted by issues that are more of a footnote then a primary issue of the event. It is an active attempt to manipulate us into yet more war and always it is based on lies, this is the most important matter and we need to guide people to the primary relevance of this fact and not let details marginalise this critical for humanity understanding. The Event was predicted – “ Paris Match on October 2nd. Perhaps the start of a Europe wide Truth awareness Nick ? Again this is another good article following on from one from Paul Craig Jackson’s and one I have read from Kevin Barrett who was in Paris only hours before these incidents happened. Here below is a copy and paste of a cunning way for the BBC to brainwash a nation via linking it to sport and showing some Entente Cordiale solidarity by dint of the English being encouraged to sing the French National Anthem before the home friendly between England and France . I am sure the 70-80 thousand supporters will oblige, sadly. See below for the paste. Roy Hodgson welcomed the decision to play Tuesday’s friendly between England and France at Wembley, after Friday’s attacks in Paris killed 129 people. Three suicide bombers died in blasts outside the Stade de France while Les Bleus played Germany. But French Football Federation (FFF) president Noel le Graet said his team will still travel to London. “We respect the decision and will prepare accordingly, both on and off the pitch,” said England boss Hodgson. “The match will be a serious occasion but one that shows that the football world is united against these atrocities. England fans are being asked to sing the French national anthem before the game as a show of solidarity. YEP ANOTHER FALSE FLAG ,THE 13TH FRIDAY,DIDNT THE KNIGHTS TEMPLARS GET OUSTED FROM FRANCE BY THE VATICAN ON THE FRIDAY THE 13TH, THIS IS ALL OCCULTIC, AND THE CLIMATE TALKS IN FRANCE,AND G20 IN TURKEY ,TTHINGS ARE RAMPING UP BY THE ELITE SCUM .